We bring smiles and the healing power of animals to millions of hospitalized children around the world through a very special television channel. 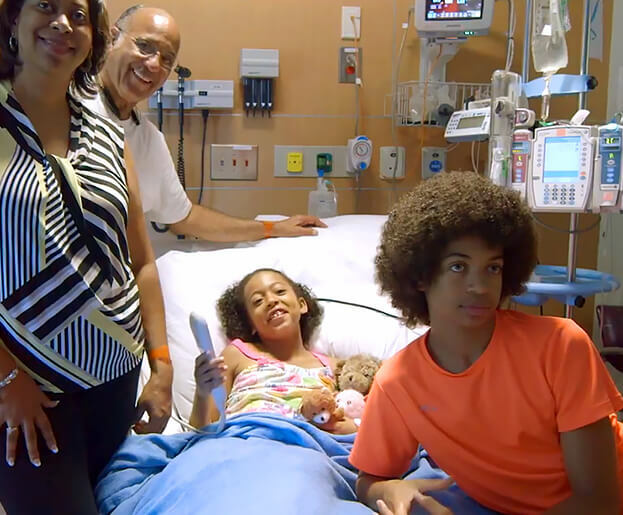 Watch the power of this joy firsthand in one young patient’s story. Watch examples of San Diego Zoo Kids' fun, heartwarming, and educational animal programming! Over 100 years ago, the San Diego Zoo was founded to benefit the children of San Diego. 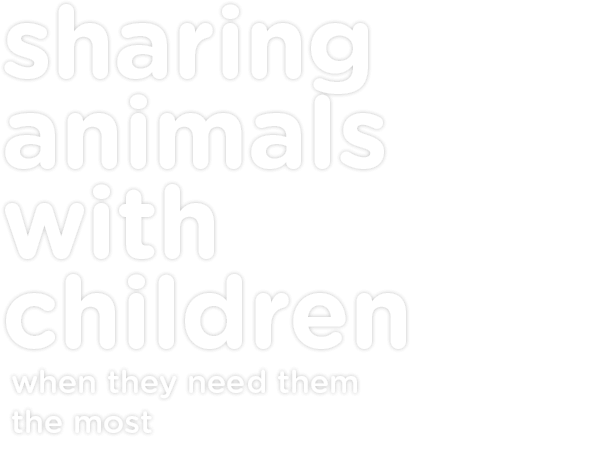 Since then, millions of children have had the extraordinary opportunity to connect with and make new animal friends at the Zoo. 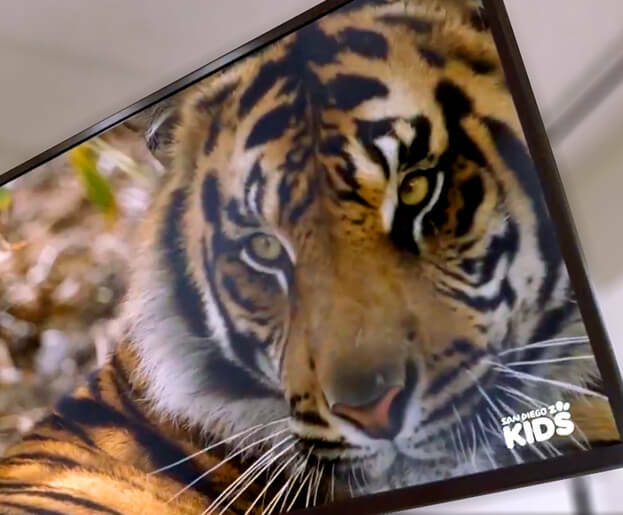 Now San Diego Zoo Global has broadened its reach and provides a kid-friendly, commercial-free television channel just for children's hospitals and Ronald McDonald Houses nationwide. San Diego Zoo Kids! When children can't come to the Zoo, San Diego Zoo Kids brings the Zoo to them! From leaping lemurs to precious pandas, this unique programming is spreading laughter, joy, and fun to children who need it most—24 hours a day! By watching San Diego Zoo Kids, patients can virtually experience the world of animals, zoos, and aquariums. It's an engaging activity that takes their mind off their condition for a while, allowing them to relax, sleep better—and heal. And that's what everyone wants—for kids to heal, be happy, and return home! 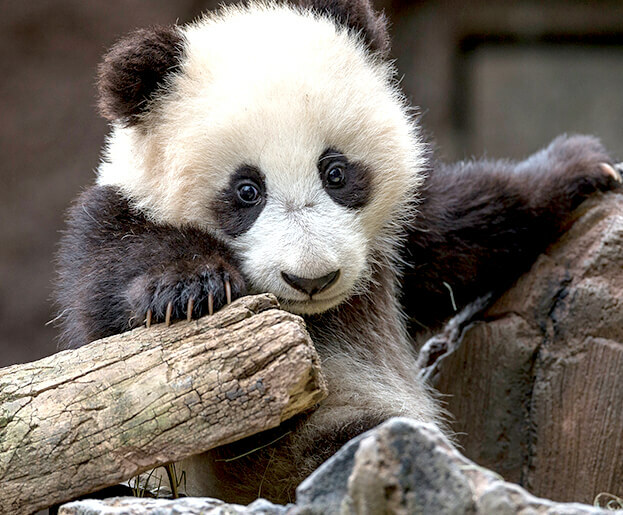 San Diego Zoo Kids channel to your children's hospital or Ronald McDonald House. San Diego Zoo Kids airs in 222 children's hospitals and Ronald McDonald Houses in 39 states and D.C., and 9 countries, with many more joining in the next few months! Here's what children and parents are saying about San Diego Zoo Kids. My daughter is undergoing a bone marrow transplant for leukemia at the Children's Hospital of Penn (CHOP). She LIVES for the monkey and panda cam...You have no idea how much we watch it and how much joy it brings her! This is the third time our son's cancer has come back. This has been a difficult challenge for our family and we have struggled with not losing hope. My son is optimistic and happy and stays positive through it all, but this last visit has really dampened his spirits. He remains strong, but I can tell he is getting tired with his fight. It's been hard to find things he likes to do to motivate him to continue his fight and continue his journey. At times the only thing that brings joy or interest to him is the Zoo Channel. As a mother seeing her child go through these struggles and challenges and ups and downs and heartbreak, to see there is still something that he likes in his hardest moments is just the best. Thank you for having this. I only wish I could take this home with us! Our daughter (4 years old) just lost her eyesight. We are hoping with surgery she will get her eye sight back, but it will be a few months before we see anything. Our daughter has had quite the adjustment, and we have been worried about her mood. She hasn't been talking much. We turned on the Zoo Channel while making dinner one night because we saw the advertisement on our dresser. Our daughter loves to listen to radio and tv. The segment came on about the elephants, and all the sudden my husband and I heard a squeal. We went to look in on her and we see a big smile on her face and heard her giggling and squealing again. She was making the sound of the elephants, one of her favorite animals. My husband and I broke out in tears, it was one of the most precious memories we have now and are always squealing like elephants. I am sure our neighbors and other families in the house are tired of hearing the squealing, but that is the sound of our life changing in a very positive way. I cannot begin to express our thanks for what this has meant to our family. It has changed our lives and our daughter. We hope one day she will be able to see the Zoo Channel, but for now hearing it has brought new life. 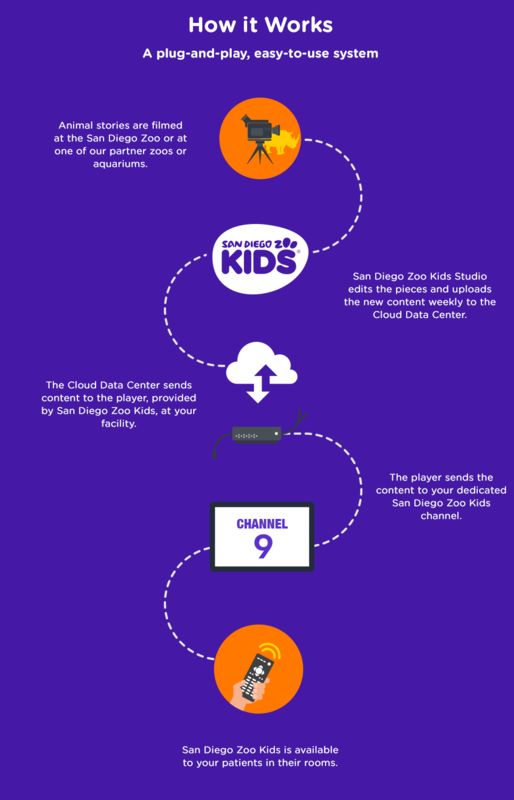 Thanks to a very generous donation from Denny Sanford, San Diego Zoo Global has been challenged to deliver San Diego Zoo Kids channel to 300 children's hospitals and Ronald McDonald Houses across the country. At first glance, it might not seem that zoos have a similar mission to children's hospitals and Ronald McDonald Houses. 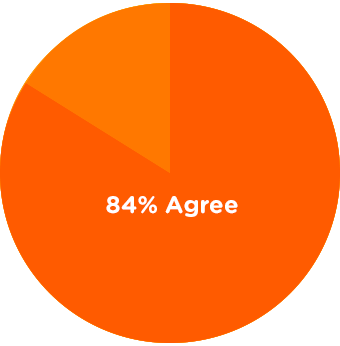 But these organizations share the common goals of saving, healing, and nurturing. Why shouldn't they work together? Thanks to the support of IMLS, as part of the Museums for America Community Anchors Initiative, San Diego Zoo Global is making that happen. In 2017, IMLS awarded San Diego Zoo Global a Museums for America grant. The funds are helping bring San Diego Zoo Kids to 75 children's hospitals and Ronald McDonald House Charities facilities across the nation from 2017-2020.
to Children in My Facility!